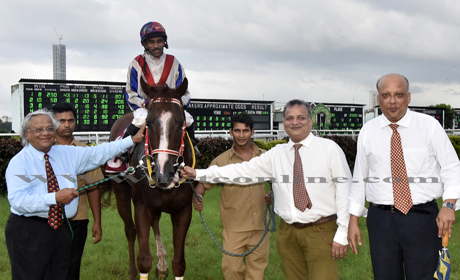 Trainer Javed Khan`s colt, Gloaming (CS Jodha-up) carried his winter season`s form to another victory, his fourth in-a-row, on the way to claiming the 1,400m Argiano Cup, Tuedsy`s feature event. 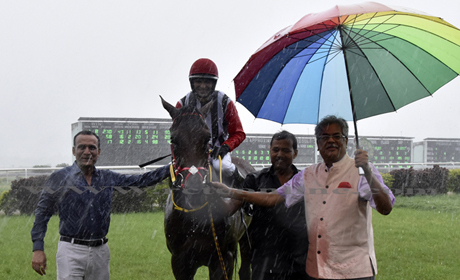 The afternoon also witnessed trainer Vijay Singh ruling the roost in an eight-event card as he saddled a quadruple of wins, including the friendless runner, Splash Proof (app. 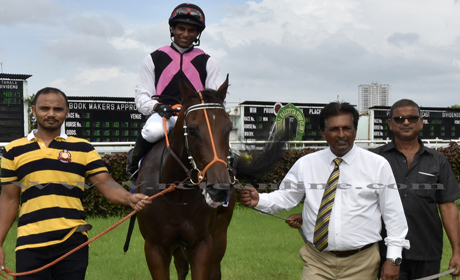 Haasib Naidu), the course favourite, Iconia (app Nikhil Naidu), Alyssa (Neeraj Rawal) and Avarua (Naidu). Vijay was, however, questioned about the improved performance of Alyssa who had run like a dud, in her previous start when a 6/4 favourite. However, many felt it was a mere eyewash. Coming back to Gloaming; who won his race like a champion galloper. The winner was held back third or fourth; until a furlong from home but the Revel-Flair Queen colt pounced on the early leaders – Mogadishu (S. Zervan), Captain Cook (Dashrath) and Sweet Music (app. RS Bhati), all fancied between 5`s and 7`s – to fully justify his 4/1 odds. Vijay`s victory procession begun with the 7/10 hot favourite, Iconia in the lower division of the 1,100m Tangiers Handicap. The Excellent Art son shot into the winning lead, inside the final furlong after allowing the 7/2 chance in the betting, Romantic Lass (C. Alford), to call the shots. It was the three-year-old`s back-to-back win and he could do the trick again over a slightly extended sprint. Splash Proof`s superior Class could never be questioned but the five-year-old was out on the track after more than a year. 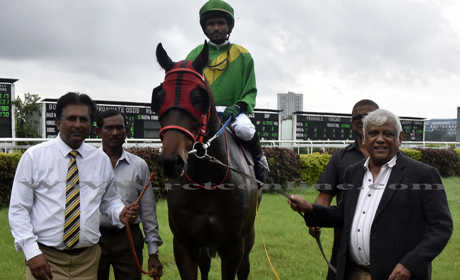 However, apprentice Hasib handled the Whatsinthescript tenderly – keeping him well off the pace and bringing the friendless horse into the fray, 200m from home, as a quietly fancied runners, Indus Prince (Naidu) was disputing the issue with another late comer, Running Hand (app. P. Vikram). In the same race, Javed`s 5/2 favourite, Ascension (Jodha) burst a blood vessel after being up with the field till a furlong from home. Alyssa had performed badly in her last start and doubts about the intension of the stable pushed her odds to 6/1 in the Ballet Master Handicap. The filly, however, had other ideas as she made every post of the 1,400m trip a winning one. In the same race, Javed another 5/2 favourite Stelvio Pass (Jodha) went backwards, after being up with the field till 300m from home. 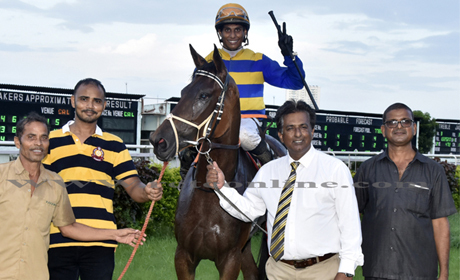 Finally, Vijay`s Doosra, Avarua – a 7/2 chance in the betting -- landed the 1,800m Pentagon Handicap while the stable`s Panchovilla (Neeraj) was a rage of the backers. The 14/10 favourite, led till 300m from home but went backwards as trainer Harvinder Bath`s Dixie Diamond (Shezad Khan) disputed the lead with Avarua, who managed to score in a camera-finish, close home. The 1,100m Court Minstrel Plate was held in a pouring rain. 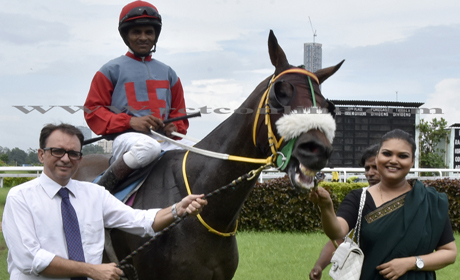 However, Bharath Singh`s 7/2 chance Lumos (Alford) relished it most. The Arazan colt appeared to be travelling well, despite shifting out badly in the home straight, to hand the top-weighted, Vijay`s 12/10 favourite, Lancaster (Zervan), a two-length beating. 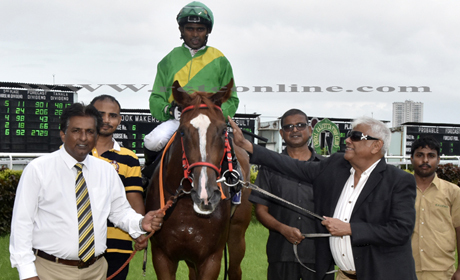 Daniel David`s Hurricane Storm (Ranidan Singh) did win the 1,200m Brush Aside Handicap at long odds but it landed the trainer in trouble for the in-and-out running of the horse. 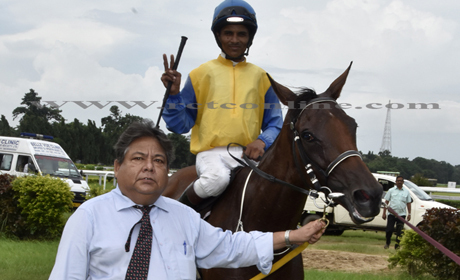 The fellow trainer Deepak Karki, however, escaped such punishment as his charge Shape The Scape had shown some form in her previous outing, over a 1,200m trip. The six-year-old, in the upper division of the 1,100m Tangiers Handicap made every post a winning one.